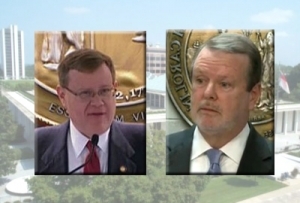 North Carolina state lawmakers will return for a special session at noon Tuesday to take up the captions for this fall’s constitutional amendments and perhaps more. Policy Watch has obtained a copy of the official letter calling lawmakers back into session. N.C. House Rep. Verla Insko, an Orange County Democrat, confirmed the news on Twitter Monday afternoon. It’s official: we’ve been called back into session tomorrow at noon. #NCGA republicans don’t want the bipartisan commission to draft summaries of the constitutional amendments so they can frame them how they want. They’re trying to retain power at all costs. Multiple Democrats said they were expecting a return then, as Republicans made their pitch over the weekend to head off the work of a constitutional commission that would have been charged with crafting the captions for the six amendments on the ballot. That three-member commission includes two Democrats, including Secretary of State Elaine Marshall and Attorney General Josh Stein. It also includes Legislative Services Officer Paul Coble, a Republican. The commission seemed to slip GOP lawmakers’ notice when they voted to place the amendments on the ballot this year. In a letter to House Speaker Tim Moore this weekend, Rep. David Lewis, an influential Harnett County Republican, questioned whether the commission would attempt to sway voters against the amendments with the caption language. Of course, Republicans have been accused of using their own “rosy” language to shape voters’ perception of the amendments. Progressives, including Policy Watch’s Rob Schofield, say they hope all six amendments—which include new voter ID restrictions—will be voted down. Lawmakers need written requests to return to session from three-fifths of the members in the House and Senate, a reachable goal for a legislature that’s dominated by Republicans.